Between 50 000 and 60 000 years ago, when the sea level was lower, Middle Stone Age people first lived in the Klipgat Cave (on Hoy’s Koppie above Hermanus). They left remains of their food, fires, and stone tools. Klipgat has also revealed some of the oldest pottery found in South Africa. The 2 000-year-old pieces of pottery were left by San hunter-gatherers. There are also rock paintings and caves to be found at Die Kelders (The Caves) on the southeast side of Walker Bay. Hermanus was first discovered by Europeans in the 1820s by Hermanus Pieters, a local teacher in Caledon who followed an elephant trail leading through the Hemel-en-Aarde Valley to the sea where he discovered a fresh spring and greener pastures. The area, then became known as Hermanuspietersforntein, began to attract summer grazers and farmers with their families. It was not settled until the 1850s when fishermen settled in the area attracted to Walker Bay’s abundance of fish. By the early 1900’s the excellent fishing, astounding natural beauty, and the “healing” sea air began to attract holiday goers from around the world. Doctors from as far away as Harley Street, London would often prescribe a visit to Hermanus’ “champagne air”. 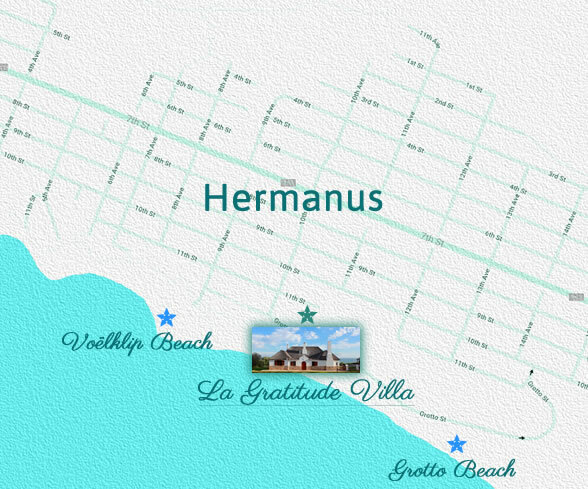 As its name and population grew, Hermanus acquired municipal status in 1904. However, it never lost its tranquillity. Recognising this, Sir William Hoy, general manager of the South African Railways, was so taken with Hermanus that, together with Jan Smuts (later General), they made certain that the railway did not reach the town. Hence, Hermanus boasts the only railway station in South Africa with no tracks, trains or timetables. Since then Hermanus has established a steady international reputation as a holiday destination of outstanding beauty and exceptional activities. 90 years on, La Gratitude is still the quintessential colonial holiday home.